We are riding along on Going-to-the-Sun Road in Glacier National Park and pull into a turnout. We get out of the car and walk down an embankment to view McDonald Falls. Howard and I are enjoying the magnificent scenery and I am taking a few photos. I see movement out of the corner of my eye and glance in that direction. 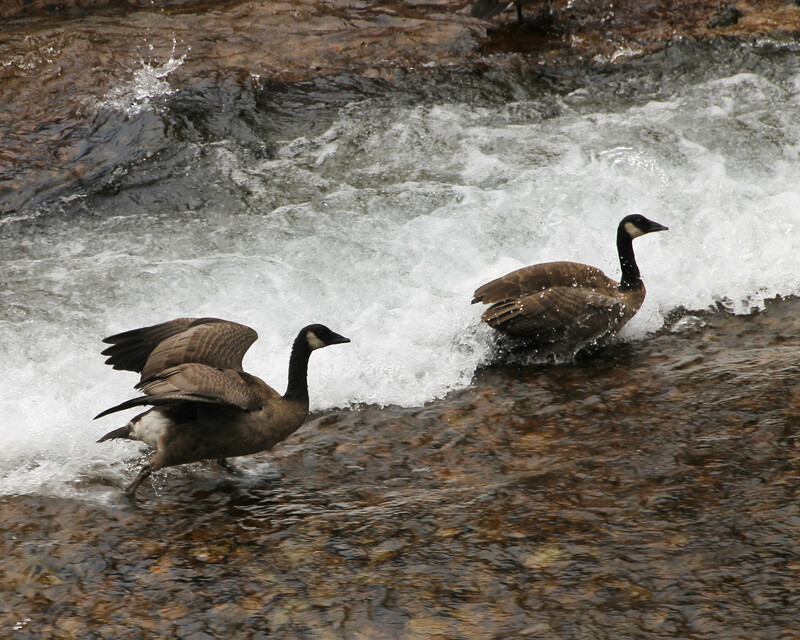 On the other side of McDonald Creek is a family of Canada Geese coming out of the forest They seem in a big hurry and within seconds I realize why. 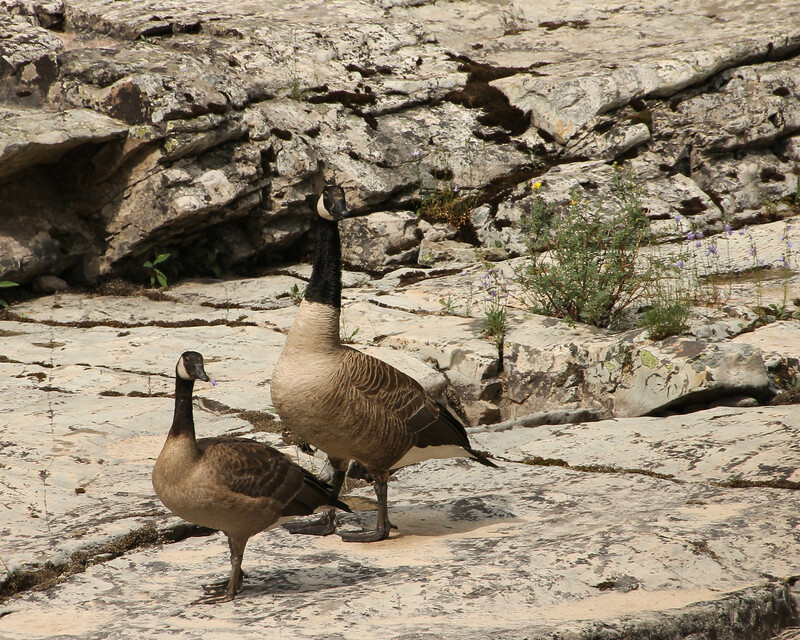 Behind them, emerging from the forest, are two hikers. 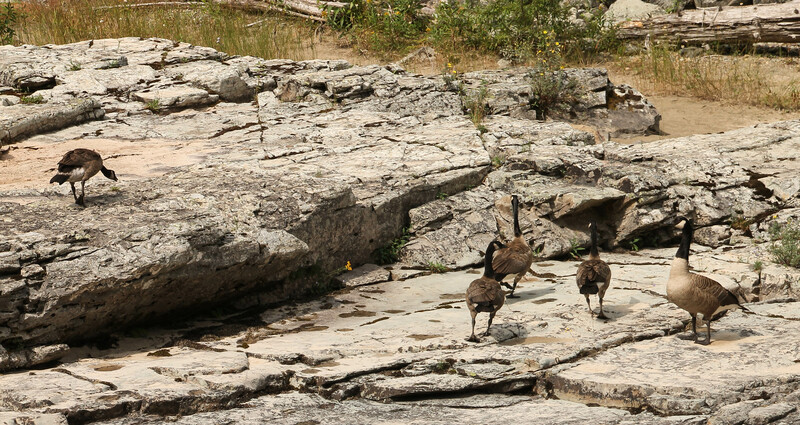 The Canada Goose Family, two parents and three juveniles, are heading for the creek traversing over rocks toward their destination. I don’t believe they realize just how close they are to McDonald falls. 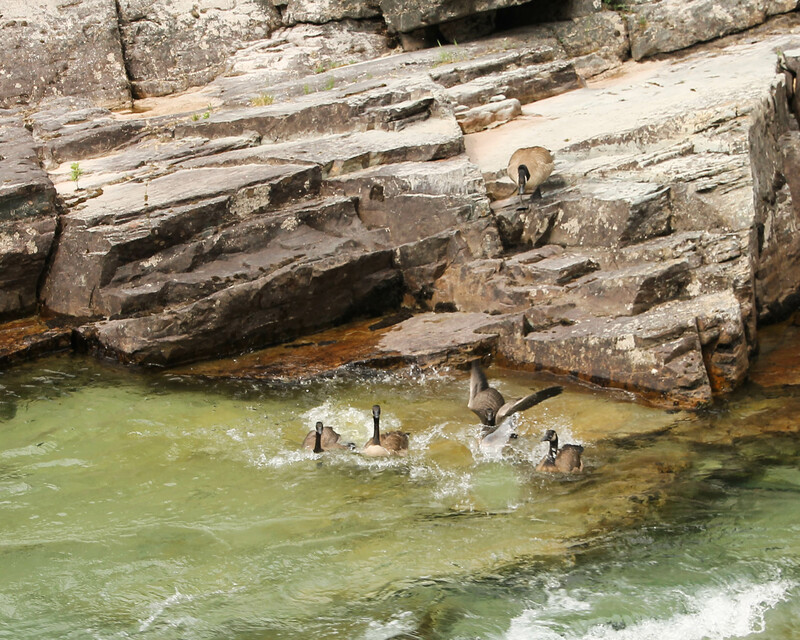 They should have been more afraid of the falls than the hikers. 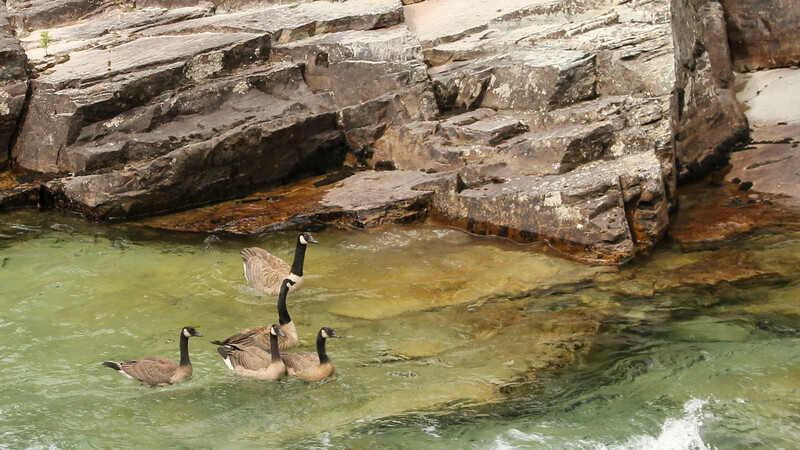 In the creek the father goes, followed by the rest of his family. 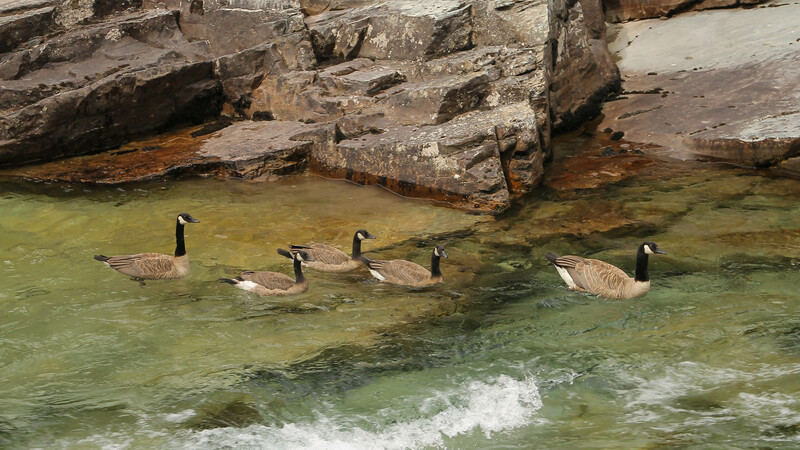 All five make it into the creek. Notice again how they line up. I think at this point they realize their mistake! 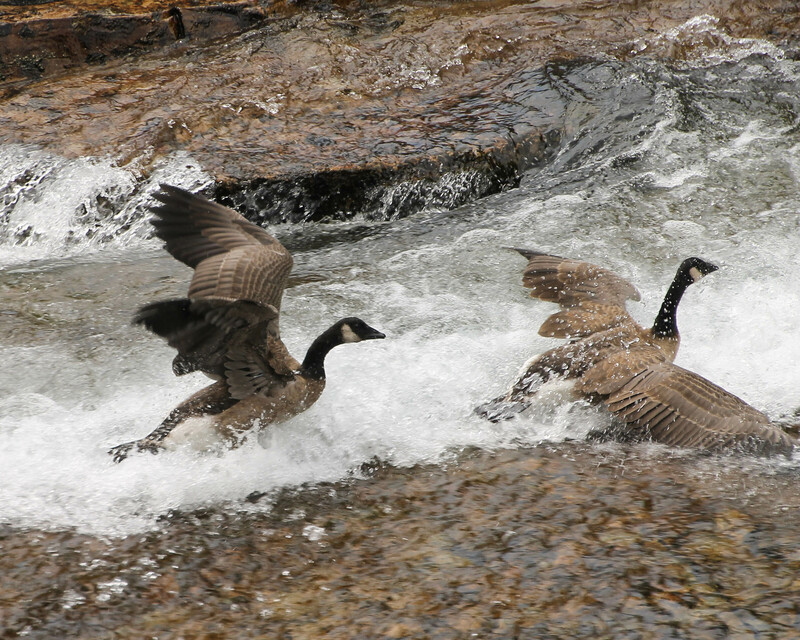 They are trying to swim upstream, the current is swift, they are not doing well. 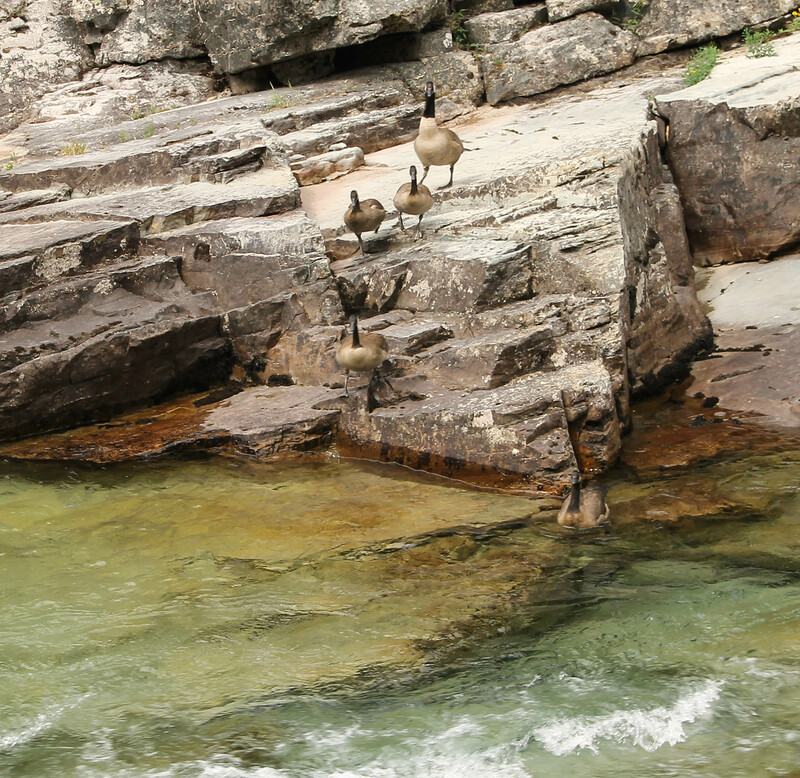 They try to climb up on some boulders to get out of the creek, the boulders are slick and they keep sliding backward. 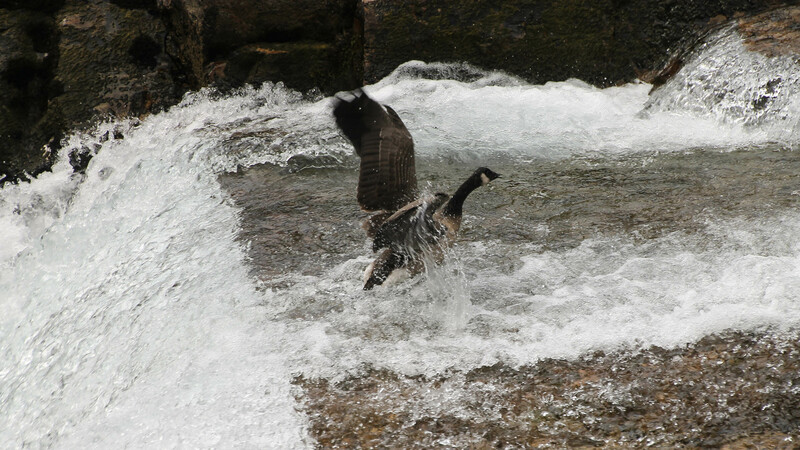 They flap their wings trying to lift out of the fast flowing water, it doesn’t help. They are getting soaked. Look at their face, a look of pure determination. Finally, they get a foot hold and four of the five make it up out of the water. 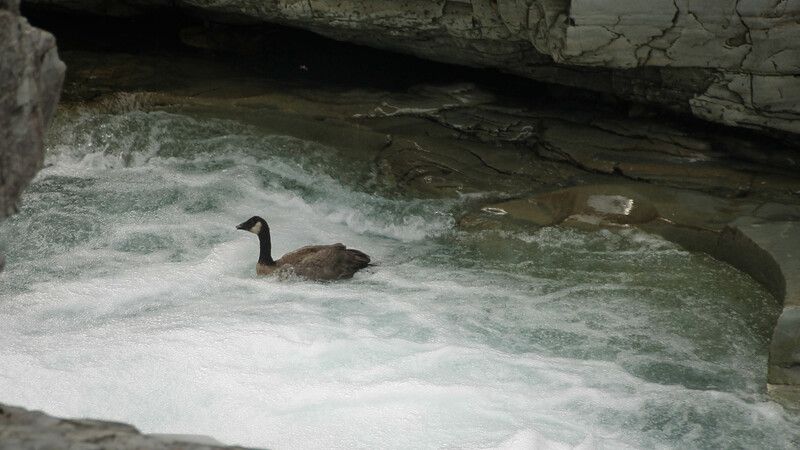 One of the young is having trouble, the current is too swift and over the falls it goes. 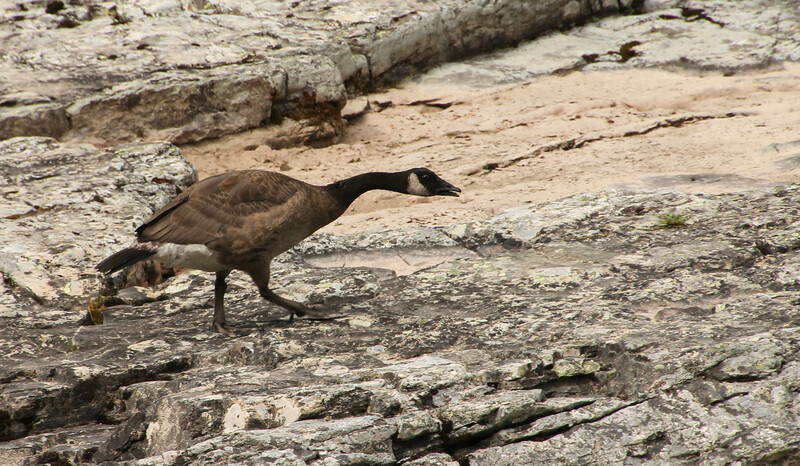 It tries to climb up on a boulder in the pool in which it landed. The boulder is too wet and too high. I was watching its face, it was like it just decided this wasn’t working and resolved to float out of the pool and further down stream. It turned and went over another small fall. It floated several feet before it got a foot hold and was able to climb up and out. I was not able to see where it climbed out. 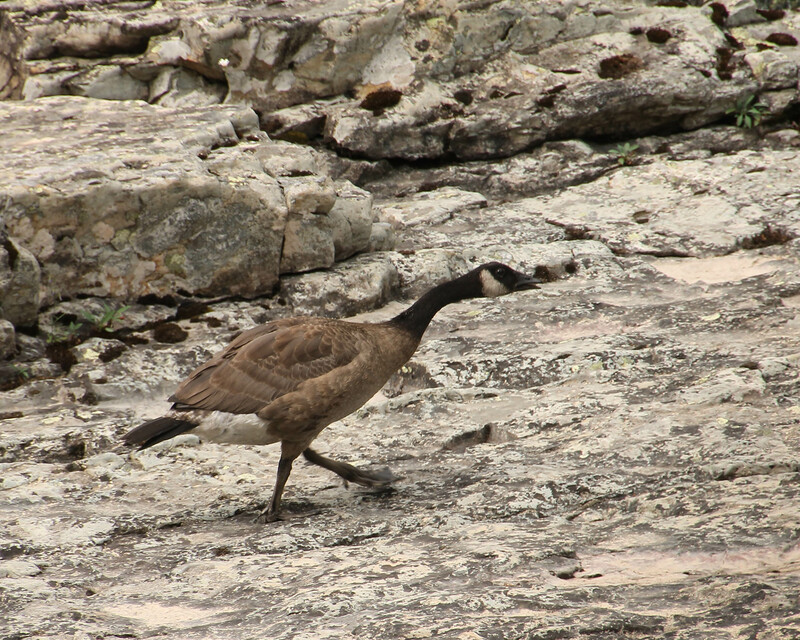 At this point it was on a slope of solid rock and was able to make its way toward its family. 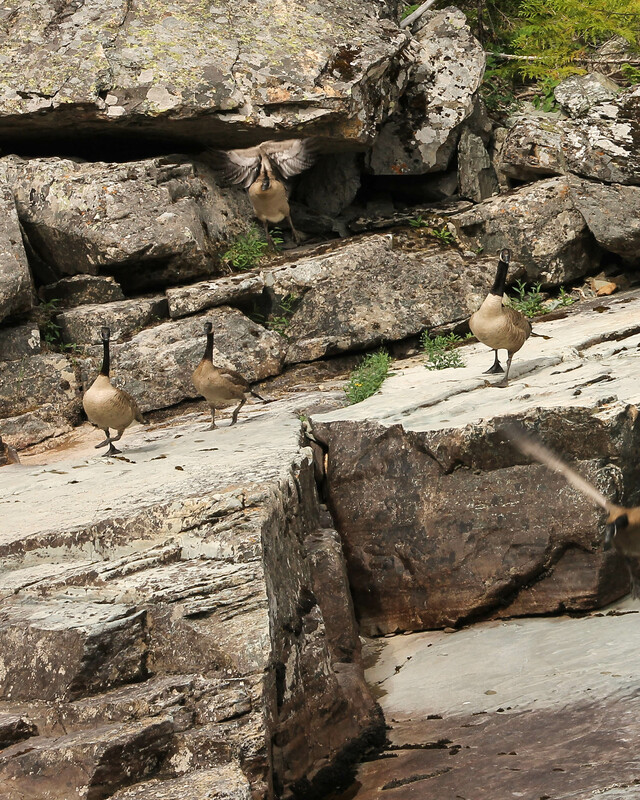 As it waddled toward them it was fussing the entire time. Once the family was united they hurried back toward the woods. Off they go back into the forest – all five of them!! 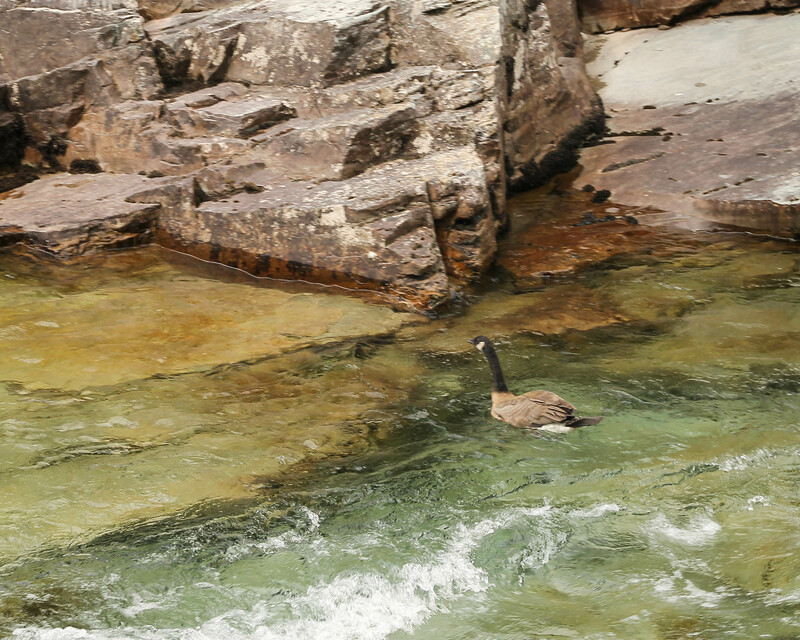 Notice the poor, over the falls, guy. Looks like he is still fussing. So glad this episode ended well. 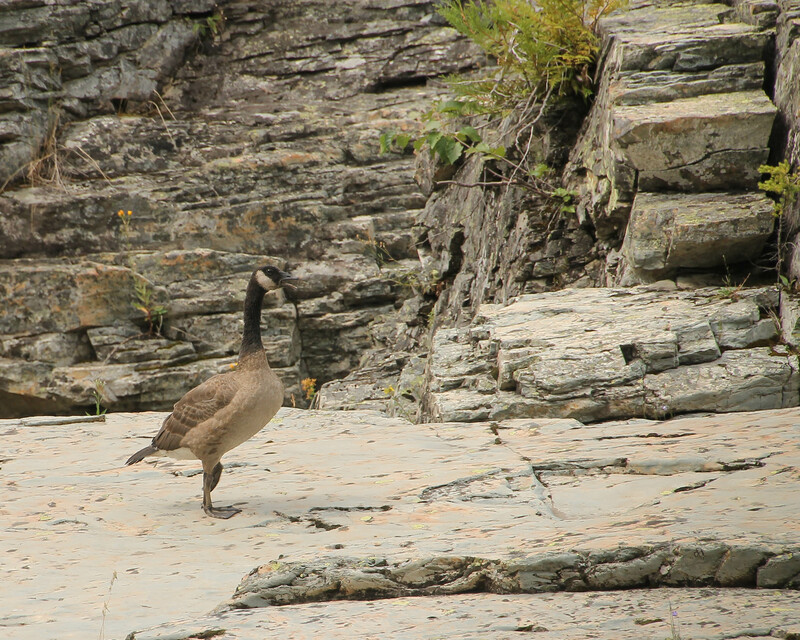 And, everyone was clapping when it got out of the creek and waddled its way up the slope of rocks to its family! The hikers, dang them, were sitting on a boulder watching along with everyone else. I was so worried that this was not going to end well. Yay!!! LuAnn, it was a few minutes of worry, but so glad it ended well! 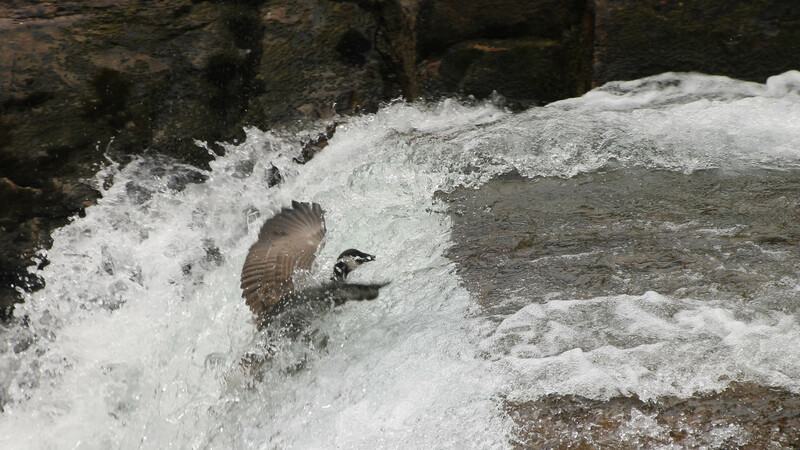 Hopefully, these types of experiences will help these birds live longer. This little one is stronger for this experience, but it sure was not happy! Thanks for the story Sheila! Luv happy endings! Gale, you are welcome! Love happy endings!!! This has been the best story treat of my day! 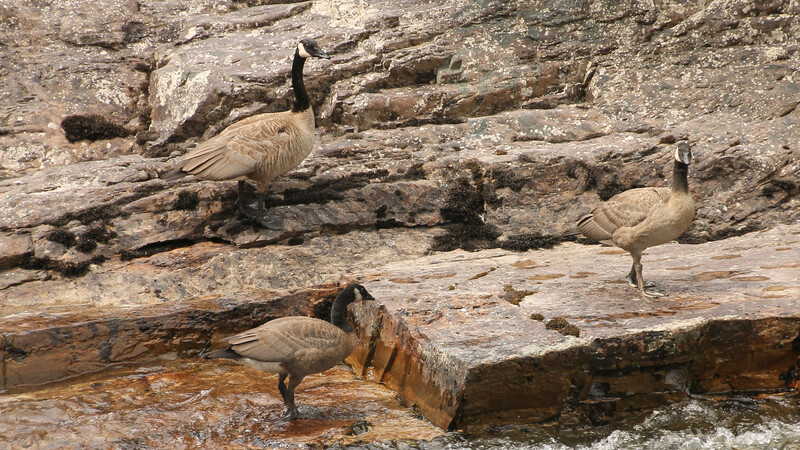 Thank you SO MUCH for the entire saga of the Canada Goose family! I can just see y’all cheering for one of the juvies, and I would have been there doing the same with you! So precious! Hello Anne Marie! I am so glad you enjoyed this post! Hugs and love to you! I’m just stopping by to echo what everybody else said, Sheila. A great story, well told! I was on the edge of my seat while reading it. Then, relief! 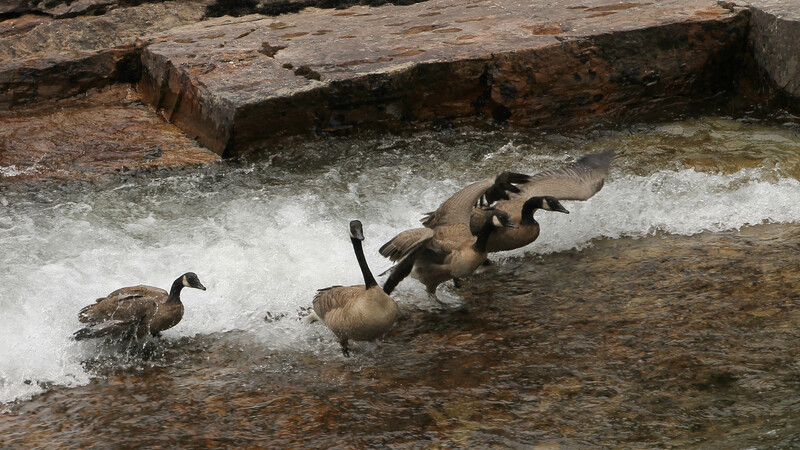 It was so much fun observing these geese, but chilling seeing the one juvenile going over the falls. 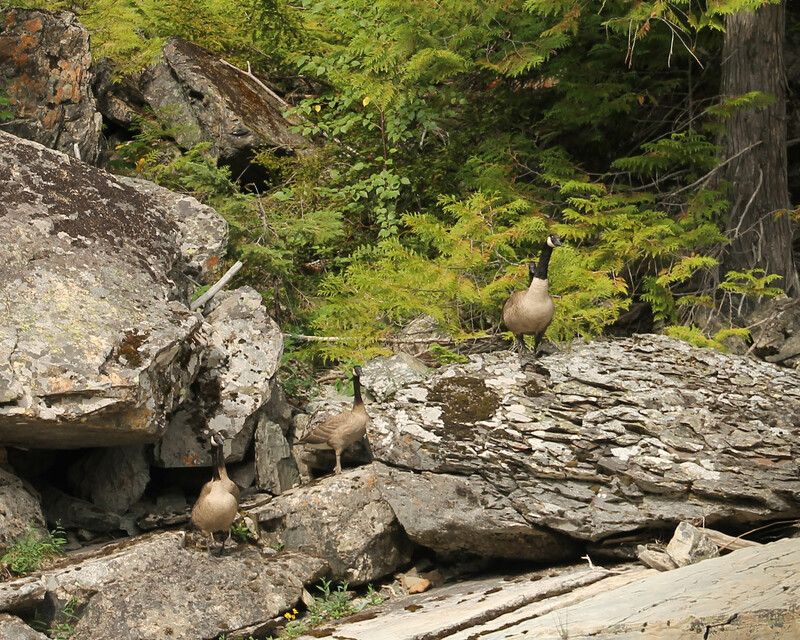 It was interesting to observe other people’s reactions to seeing these birds in distress and we both loved the fact that there are still compassion people out there! One of life’s biggest mysteries; how can people, in general, be so horrible – really horrible in so many notable instances; and yet other people – as well as some who act horribly in one instance, yet do good in other circumstances – be so really wonderful. If we could only solve that we’d be on our way to paradise-on-earth. If only.